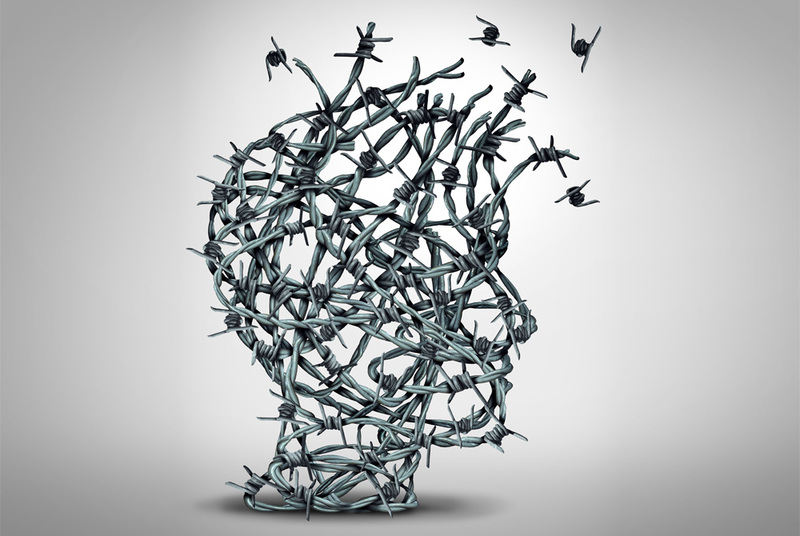 In thinking about anxiety, it becomes necessary to distinguish anxiety from fear. Anxiety is a feeling state (like someone saying they feel stressed or experiencing stress), , or a state of being that arises from a variety of influences. Anxiety refers to something that we are not fully aware of. Whereas fear, is a feeling and state of being that is response to a specific and known object or experience. Anxiety can be mild and normal or become chronic. Normal anxiety is seen to be proportionate to an objective or perceived threat and when it is dealt with at a very conscious level. However, when a feeling of anxiety is not managed at a more immediate and conscious level and we begin to experience patterns of unremitting and ongoing symptoms of feeling tense, agitated, constricted and emotionally and physically distressed, these symptoms begin to immobilise us in our everyday living. If we develop ways of coping that are not personally supportive, healthy or helpful, anxiety remains deep-seated and we develop a neurosis, frequently experiencing a threat to our existence and our relational world. Often these unhelpful ways of existing remain out of our awareness and we find ourselves behaving with avoidance and clever disguise, or conform to others’ perceived demands made on us. Sometimes, these neurotic symptoms become severely disabling where we find that we want to isolate and retreat from life itself. Generalised Anxiety Disorder (GAD): Typically, a person will worry about many different things fairly frequently throughout the day. Worries could be around work, personal performance, health issues, family and interpersonal relationships, with these worries impacting on the quality of their daily experiences. Social Phobia: where a person feels a thereat of being embarrassed, criticised, and a strong fear of being humiliated with experiences such as mixing and talking with others, public speaking, or simply asserting themselves. Specific phobias: There is a vast range of phobias, but the more common ones are having a phobia of snakes, spiders, cockroaches, moths or aeroplanes and bridges, to name a few. Having a fear in the face of an actual threat is seen as a rational response to that situation. However, a phobia becomes an irrational fear of something, because it is in the absence of a real threat, but is perceived as one, for example seeing a spider on a T.V screen. Panic Disorder: Severe reactions to phobias can often escalate into a state of panic, called ‘panic attack’. Persistent and overwhelming anxiety such as, an increased pulse, pounding heart rate, palpitations, breathing difficulties, a feeling of chocking, nausea, fainting, feeling drained and cold or sweaty, that are frequently experienced for over a month is viewed as a Panic Disorder. Obsessive Compulsive Disorder: Unwanted and intrusive thoughts are relieved by compulsive behaviour that becomes an obsession over time. For example, a fear of leaving the kitchen stove on, or, a fear of germs is relieved by checking the stove or washing ones hands. This is a very normal and healthy response to a natural thought of a daily concern. However, when the these thoughts become repetitive, and the compulsions to check and re-check becomes a ritual and obsession, this can significantly interfere with a persons activities of daily living, and interpersonal relationships. Post Traumatic Stress Disorder (PTSD): If symptoms of distress (flash-backs, upsetting dreams, difficulty relaxing and avoidance of anything related to the experience) following a traumatic experience (war, personal assault, witnessing trauma an accident or disaster) becomes entrenched and interferes with ones daily living for at least a month, they are said to be experiencing PTSD.